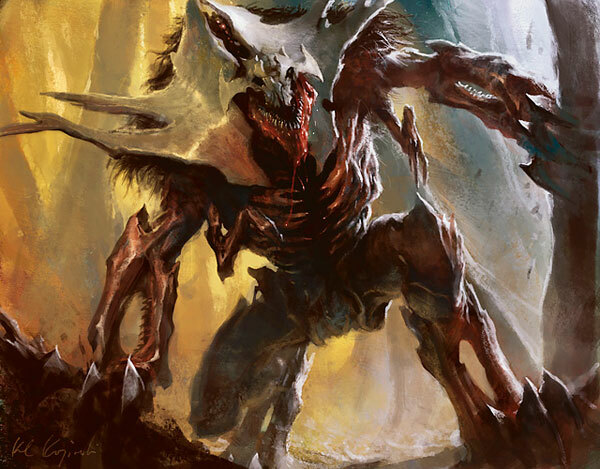 It's Praetor Week, so today we'll take a look at these walking (or lurching, or skittering) symbols of power who rule the five factions of New Phyrexia. These are icons of Phyrexia viewed through the lenses of the five colors of mana, each one of them a representation of the dark principles and twisted philosophies of its faction. 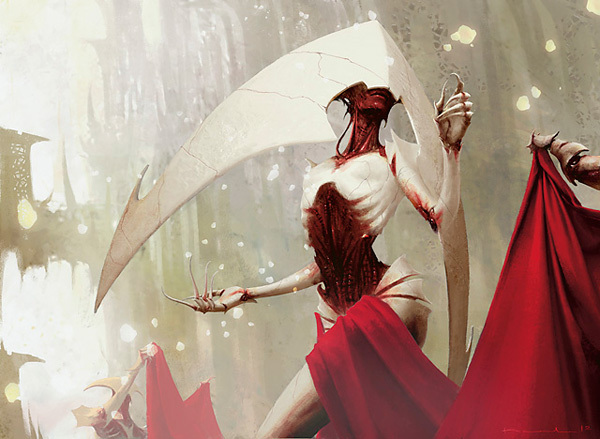 Role: Elesh Norn is the praetor of the white-aligned Phyrexian faction, the Machine Orthodoxy. She oversees all sects of the Machine Orthodoxy and commands great respect from all those who belong to the entire faction. She often goes by the title "Praetor of Unity." Appearance: Like many of her faction, Elesh Norn has no skin, but is outfitted with cracked, porcelain-like metal over her raw musculature. Her most recognizable characteristic is the set of broad blades of that bonelike metal that sweep back and away from her face. She often has lower-ranked cenobites and suture priests carrying her train and inscribing her utterances. Agenda: Elesh Norn rules over all the sects of the Machine Orthodoxy but abides by the particulars of none. She does believe, however, in the importance of unifying all of Phyrexia under a single banner by indoctrinating all life with Phyrexian beliefs. She sought to help induct Karn as the Father of Machines, but in her heart she believes that the Father of Machines is more of a symbolic figurehead than a true position of power, and she means to install a puppet in that role whom she can influence. Trivia:Cenobite is an English word; it refers to a member of religious group who lives with others in a convent or community. 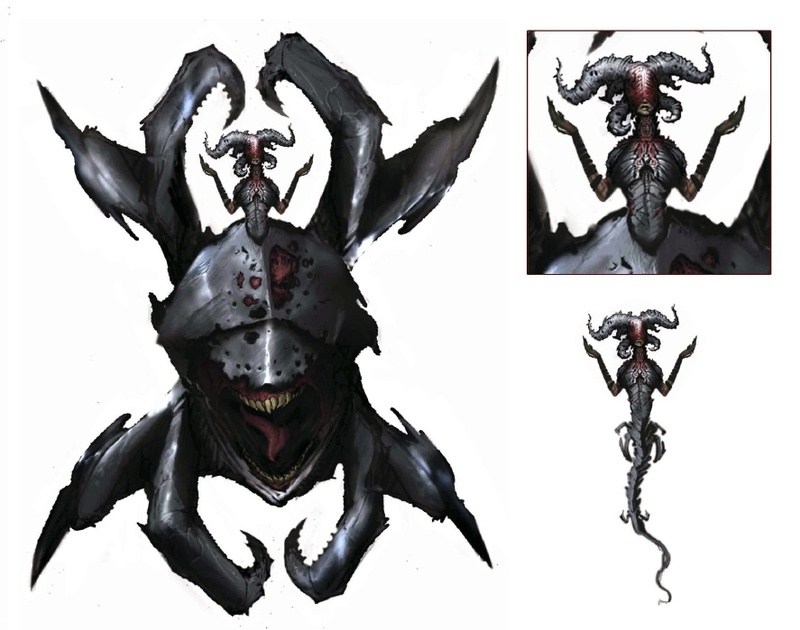 The white-aligned Phyrexian faction, the Machine Orthodoxy, includes many cenobites as lesser priests and hierarchs, and the praetor Elesh Norn is the highest-ranking of such clergy—hence "Grand Cenobite." Role: Jix-Gitaxias is the praetor of the blue-aligned Phyrexian faction, the Progress Engine. He serves as the brilliant mastermind behind the sociopathic experiments of the so-called Great Synthesis. Appearance: Hunched and barbed, Jin-Gitaxias is covered in the chromelike metals common to Phyrexians of the Progress Engine. Jin-Gitaxias can communicate in a variety of modes and languages, including mental speech, which he uses to drill his ideals of perfection into the minds of others. As part of Jin-Gitaxias's optimized homeostasis, his ribs and spinal pillar flex and pulse disturbingly. Agenda: Jin-Gitaxias seeks the perfection of all life through the most perfect of methods: clinical experimentation. Of all the praetors, Jin-Gitaxias is the most concerned with converting the face of the world formerly known as Mirrodin to its Phyrexian ideal, from the smallest organism to the greatest sea. Jin-Gitaxias is a living storehouse of research data, collated from every tidbit of vicious exploration conducted throughout the plane. So we had to make sure that those names—including their including their postnominal epithets, such as "Core Augur"—would fit in the name bar of Magic cards. (Even then, their mana costs lost a colored mana during New Phyrexia development to make sure that the by-then-set-in-stone names would fit.) Jin-Gitaxias's initial name was the longest of the five—he was originally called "Jin-Gitaxias, the Augur of the Core." A bit of rearrangement and editing yielded the nicely efficient "Jin-Gitaxias, Core Augur." Note that "augur" here means "prognosticator" or "prophet." It doesn't mean "driller"—that's "auger," with an e. Handily for Phyrexia, Mirrodin's core came pre-drilled. Role: Sheoldred is one of the seven Steel Thanes that struggle for power over black-aligned faction of Phyrexia, and she currently holds the title of praetor. 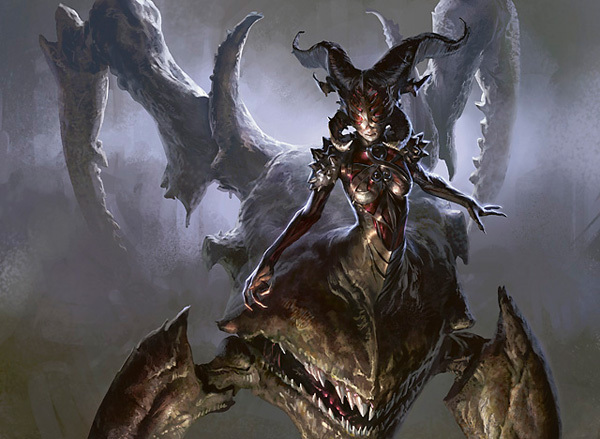 Appearance: Sheoldred appears as a feminine humanoid torso emerging from a huge-mouthed, many-jointed fiend. Her movements are spiderlike in their grace, her limbs finding purchase among the mycosynth and metallic structures of the Core. Her body is covered with plates of oily, corroded metal. Her voice is a soft, grinding whisper, and she is kept informed at all times by a constant stream of informants, spies, and underlings. Agenda: Although the agenda of the Steel Thanes in general is to overpower, corrupt, and enslave all other beings, Sheoldred herself has managed to hold power through the use of subtler methods. She collects debts and manipulates relationships in order to keep her allies in check and her foes as powerless as possible. Her goal is nothing less than control of all of Phyrexia—and she may just get her wish. Trivia: Shudderworthily, Sheoldred's body separates into two pieces. Her relatively humanoid torso actually locks into an access inlet built into her monstrous lower half. Though few have seen it happen, Sheoldred is able to shed her large, predatory, more motile lower body and slither-skitter to a new home. Note that the bizarre visual designs for the praetors (all thanks to our resident concept artist Richard Whitters) might have made their creature types quite hard to figure out. Thankfully we had already decided that the cycle would all have the creature type Praetor, since we knew that their names would not contain the term "Praetor." By the way, congratulations to Ebon Praetor and Sanguine Praetor on their new creature type—Praetor! 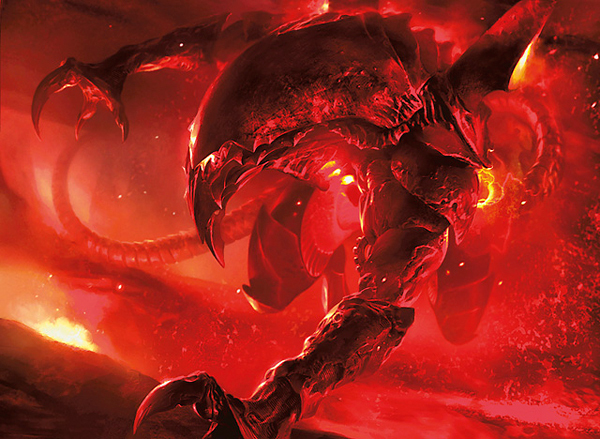 Role: Urabrask is the praetor of the Quiet Furnace, the red-aligned Phyrexian faction. Urabrask commands a more industrial side of Phyrexia, coordinating the forge workers and slag harvesters of the plane's Furnace Layer. 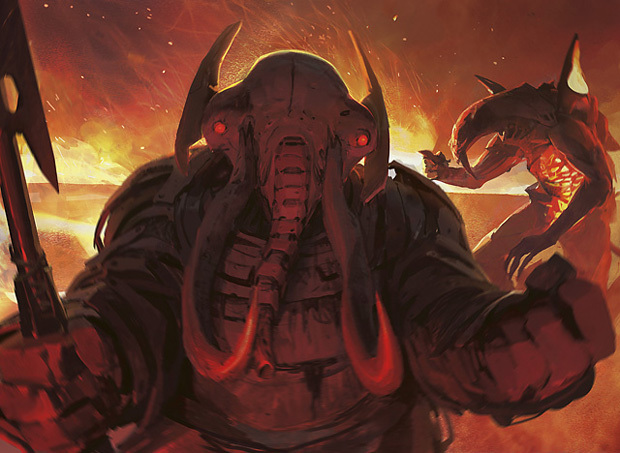 Urabrask is unique among the praetors in that he and his faction interact only in limited fashion with the rest of Phyrexia. Appearance: Urabrask is a vicious living machine, a weapon of forged excellence. His core of molten metal is housed within a frame of bone, claw, sharpened steel, and rusted iron. Flues on his back and chest vent heat and noxious gases. Urabrask's fractiousness and unpredictability are legendary; the other laborers in the Furnace Layer give him a wide berth, and his followers know that random acts of violence are to be expected. Agenda: Mirran survivors have found refuge in the Furnace Layer, and Urabrask has commanded his furnace legions to turn a blind eye to the refugees. 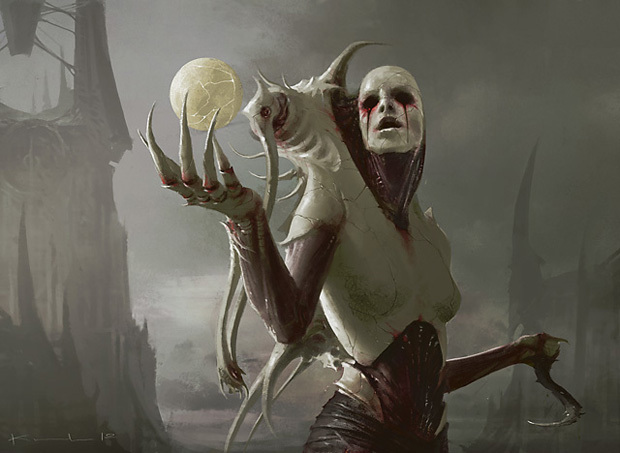 Rather than planning an endgame, Urabrask focuses on the now—and right now, he knows only that the monolithic, freedom-crushing hierarchy of the rest of Phyrexia irks him. For the time being, he works to supply the rest of Phyrexia with the fuel and raw materials it needs to dominate a world. Trivia: It was decided early on that red would be the color most resistant to Phyrexian corruption for the Scars of Mirrodin story. Red's values of self-determination, independence, and passion conflict most with the authoritarian, universal, coercive nature of Phyrexia. It took an entire block to play out, but now it's clear that the color red is sort of like the last victim to die in a zombie movie—it escapes the touch of corruption the longest and maintains defiance even as the enemy swarms around it. 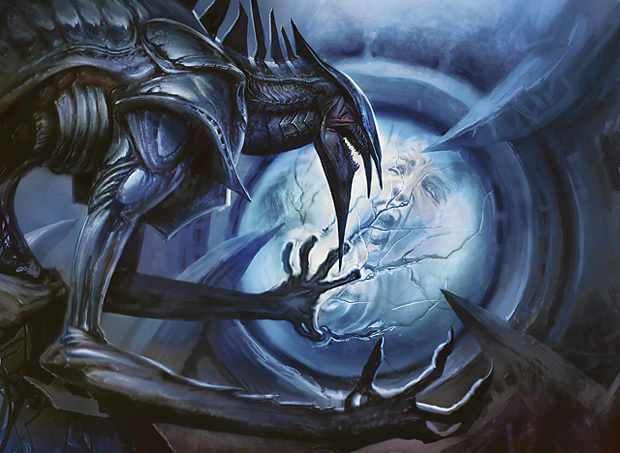 Role: Vorinclex is the praetor of the Vicious Swarm, the green-aligned Phyrexian faction. While Vorinclex leads the faction and holds ultimate authority, the Phyrexianized elf Glissa ("the Traitor") controls much of the Vicious Swarm's fighting force. Glissa pressed for Phyrexians to leave the Core and begin the assault on the surface of Mirrodin, while Vorinclex spends much of his time in the ruins of Tel-Jilad. The nature of the Vicious Swarm means that no leader is particularly revered, however—the survival of the fittest is the only sovereign among this bloc of terrifying apex predators. Appearance: Bestial and hideously anatomical, Vorinclex is the praetor who appears the most organic in his construction—and yet his philosophy aligns with Phyrexia's hatred of flesh and idealization of the machine. Grown deep within the Core from a system of vats and birthing pods, Vorinclex is an artificial design that represents one of Phyrexia's greatest successes in replicating the ferocity and ruthlessness of nature. Agenda: Vorinclex seeks to achieve Phyrexian perfection by using the plane as one grand arena, subsuming the strong and devouring the weak. Any flaw in Phyrexia's strength is to be hunted down and consumed in a process of simulated, guided, "natural" selection. 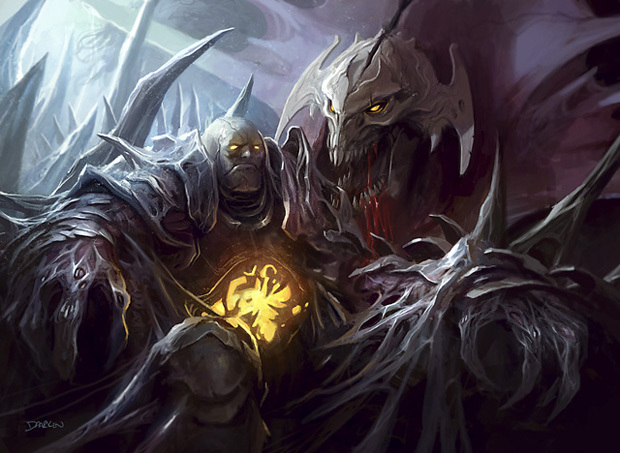 Trivia: The earliest depiction of the New Phyrexia's praetors on cards was Vorinclex, shown counseling Karn in the art of Praetor's Counsel from Mirrodin Besieged. 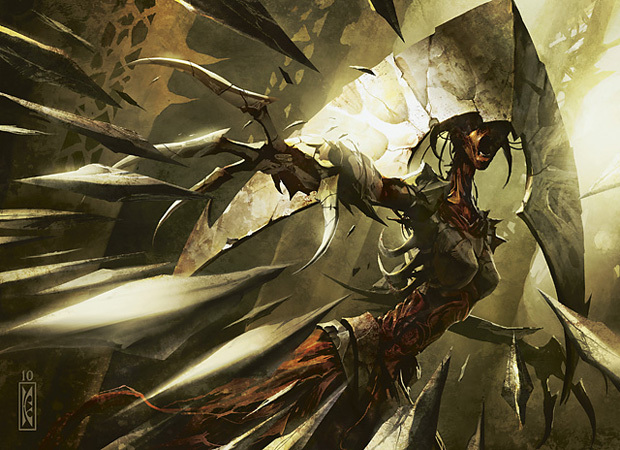 Many of the praetors show up in the art of other cards in New Phyrexia. You can also see a shot of Urabrask in the background of Act of Aggression. Jin-Gitaxias is depicted doing something horrible to a victim in the art of Psychic Surgery. Elesh Norn lashes out on Marrow Shards. And Sheoldred can be seen taking possession of an Auriok's soul in the art of Praetor's Grasp. Since we've been broadcasting the Planeswalker's Guide to New Phyrexia in this space for the past five weeks, it's been a while since I've written in my actual columnist voice. I wanted to point out that we're grateful for the gobs of positive feedback we've gotten about the Guide and the twisted detail behind the look and philosophy of New Phyrexia over these last weeks. The entire creative team worked hard on that material, so I thank you for the feedback! 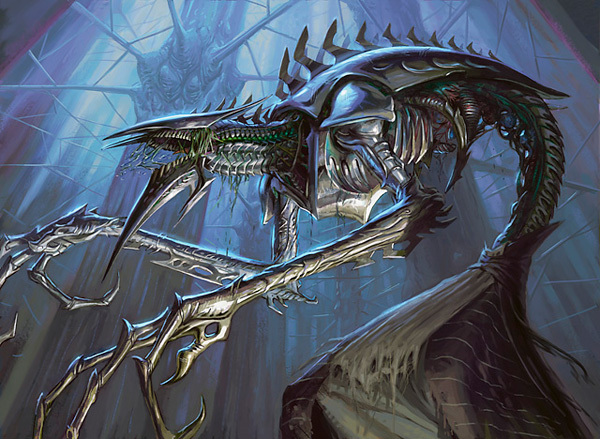 I know that the intellectually warped villainy and horrid metal-and-flesh imagery of Phyrexia is not for everyone, so I'm happy to hear there are so many of you for whom New Phyrexia is firing on all of its oily flavor-pistons. Like everything in Magic, the tone of Magic's settings swings on a pendulum, and so we'll see changes in mood and atmosphere in the future. But at the same time, when we do Phyrexia, we feel it's important to hit that note and hit it hard. There's a lot of mail to get through since the Guide started running, so let's get a good one off the top of the stack. Good question, Julian. Frankly, Phyrexia is hell on the creature type system. One man's Horror is another woman's Construct is a third person's Insect Zombie Thopter. Phyrexia is explicitly a mishmash of vat-grown flesh and engineered metal, sinew wrapped around rotors, buffered by undead tissue and shot through with viral oil. The artifact/nonartifact boundary is already blurry, and creature type boundaries even more so. So we turned to a little-used technique in creature typing and gave it a Phyrexian twist. Ever since the first Mirrodin Block we've given almost all sentient humanoids a "race" type, and most of them a "class" type too. A goblin shown brandishing a club is a Goblin Warrior. A vedalken casting a spell is a Vedalken Wizard. But when the class isn't so clear, either from the rules text, flavor text, or art of the card, we sometimes leave the class type off. Bazaar Trader, for example, is just a Goblin—he doesn't really advertise himself as a Shaman or a Warrior or a Rogue or Advisor or whatever, so we just left him a Goblin. Now check out Arcanis the Omnipotent in Gatherer. Even after the Grand Creature Type Update, he's just a Wizard—no race type. Arcanis gets a lot of his cool from the fact that his hood and cloak completely obscure his race, so we didn't give him one. The only thing that's incontrovertible is that he's a Wizard, so a Wizard he is. Same idea as the classless Goblin (heh)—his subtype calls out whatever's clear about him, rather than making a judgment call that feels wrong for the card. And it's the same idea for those raceless Phyrexians, taken to the next level. Oftentimes there just isn't a race type that properly captures what's going on in the art of those guys. In Phyrexia, your role determines most of your identity anyway. What you do to advance the civilization of Phyrexia is much more important than what vat-grown or slag-harvested materials you're made from. The concept of a "species" is just more slippery here. So some of those unclear Phyrexian creatures end up being just Clerics or Artificers—identified only by their role in the machine and not by the tattered remnants of their biological identities. We feel that it makes a strong, flavorful statement about the bizarre conditions of life on a Phyrexian plane. Thanks for your question, Julian!